James Harden started with a four point play on Wednesday night against the NY Knicks and didn’t slow down. 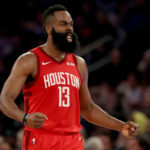 Harden finished with 61 points, 15 rebounds and 5 steals, tieing Kobe Bryant for the most scoring points for a visiting player at Madison Square Garden since 1968. Rockets 114, Knicks 110. In some unfortunate news, it looks as if the Indiana Pacers All-Star guard, Victor Oladipo, suffered a potential season ending injury in a non-contact play against the Toronto Raptors Wednesday night. Oladipo is the Pacers leading scorer this season.